Share the post "Fibroids in the Ovaries"
Read here to learn more about fibroids in the ovaries and other parts of the uterus and whether UFE is an effective form of treatment. I have heard that there can be fibroids in the ovaries. Can these be treated by UFE? No. The blood vessels to these ligaments and the ovaries are different from the ones which supply the uterus. Hence uterine artery embolization will not reach these tissues. Additionally, attempting to embolize these blood vessels that lead to the ovaries can most certainly cause infertility. At any rate, UFE can treat other types of fibroids, such as intramural, submucosal, and subserosal fibroids. Intramural fibroids are in the wall of the uterus, and can range in size from mucroscopic to larger than a grapefruit. Many of these do not cause problems unless they become quite large. There are a number of alternatives for treating these types of fibroids, but often they do not need any treatment at all. Submucous fibroids are partially in the cavity and partually in the wall of the uterus. They too can cause heavy mentrual bleeding, often refrered to as menorrhagia, as well as bleeding between periods. 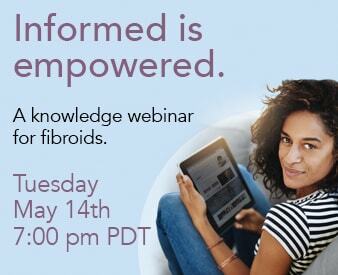 Lastly, subserous fibroids are on the outside wall of the uterus. Most fibroids can be successfully treated by using fibroid embolizaton. Moderate to large perdunculated fibroids (those that hang from the uterus by a stalk) are the only type of fibroids that are generally not treated with UFE alone. This is due to the fact that there is a small chance of the stalk breaking after the fibroid loses its blood supply, which may eventually cause the fibroid to call into the pelvis and cause additional problems. Patients with these types of fibroids can be considered as a candidate for joint procedures using a combination of UFE and laparoscopic myomectomy.